Northampton Express Bowls Club quartet Rob White, Ian Bland, Wayne Stanley and Dominic Graham are celebrating after they were crowned England’s Men’s Fours champions at the National Championships in Leamington. The four men had to win six matches to grab the glory, with a 21-12 first round win over Nottinghamshire’s Aaron Brownley, P Fyles, T Parry and S Robinson setting them on their way. In the second round, the Express four were too good for Yorkshire’s Ben Render, Shaun Wells, Dominic Kelly and Nigel Brignall as they won 21-10, but it was a little tighter in round three. The County quartet came up against Gloucestershire’s David Heath, Richie Purser, Stuart Hodges and Lee Williamson, and after a tough match they won through 19-14. Into the last eight, and Northumberland’s Steve Pollas, Philip Paxton, Simon Richardson and Craig Cooper were beaten 17-12, which set up a semi-final against Sussex’s Danny Dargan, Carl Dyer, Nigel Hooper and Michael Stone. This was a match in which the Northants men started the better, picking up three shots in the first two ends, but on the fourth end their opponents picked up four shots to go in front. That lead that was short-lived as the Express men got themselves a 9-5 lead after nine ends. Against the run of play the Sussex men picked up another count of four to level the match on the next end, but a run of successful ends for the County saw the Graham quartet take a 22-10 lead after 16 ends, and they went on to secure a 24-12 win. The final saw White, Bland, Stanley and Graham take on Ollie Lucas, Stuart Evans, Lee Haywood and Ryan Whitlock from Devon, and it was a thriller with the Northants men winning 20-19 after an extra end. After five ends the score was 4-2 in the County men’s favour, and although they managed to manufacture a decent lead at 8-2 after eight ends, a dropped count of four shots on the next end, followed by a dropped single and three shots on the next two saw their lead disappear into deficit by two at 8-10 after 11 ends. Northants hit back to get on top by seven shots after 15 ends of play at 17-10, but they could not afford to be complacent because the Devon four were really beginning to test them, and after 19 ends there was just three shots in it at 19-16. After 20 ends, Devon moved to within one shot with one end to play, where they levelled the match to take it to an extra end. On the extra end, Bland drew shot bowl just behind the jack only to see the Devon lead draw his bowl off to sit shot himself. A Devon bowl got pushed into the head which enabled Stanley to disturb it and the jack popped out a yard with Devon possibly still holding shot. With his first bowl Graham was short and Ryan Whitlock drew shot, although not that close, and Graham, with his last bowl of the match and series, drew the shot. At this point Whitlock had his last bowl still to play, and he and his rink debated for quite some time, before he went to bowl it, and when he did so it was clear as it approached the jack, that it was a little too heavy and a great cheer went up from the Northants supporters. The Express quartet will now represent England in the British Isles Championships at Belmont BC in Belfast next year. In the senior men’s singles, Michael Moulton of Heyford was representing Northants and he reached the quarter-finals. In the first round he was a 21-13 winner over Philip King from Cornwall, and then in the second round he was too good for Dorset’s Ged Costello, winning 21-17. That set up a quarter-final against John Crews from the Isle of Wight, and after a topsy-turvy battle, Moulton was edged out 21-16 in a match that lasted 26 ends. In the men’s pairs, Shaun Marriott and Jamie Walker moved into the first round proper on Sunday, but only just, after they beat Russell Francis and Graham Shadwell from Wiltshire 18-17! THE following players have been selected to represent Northants Men in a friendly against Buckinghamshire on Tuesday (Sept 6) at Stony Stratford Bowls Club at 2pm. 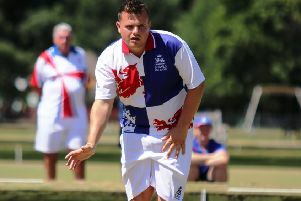 DISABILITY Bowls England is holding a ‘Top Region’ event September 18 at Daventry Town Bowls Club at Stefan Hill Sports Centre. Players will arrive for 9.30am with a photo call at 9.45am. The Regions comprise of ‘South Region E’, ‘South W Region’, ‘North Region’ and ‘Midlands Region’ and each region’s team will consist of eight players, plus one reserve, and they will play three ‘Round Robin’ sessions with start times of 10.15 am. ; 12.45 pm. and 3.15 pm, with a sit down meal to follow at 5.30 pm. The Midlands Region team has much County interest with the following players included: Adrian Mellows, Burton Latimer Town BC, Chris Gray, Burton Latimer Town BC, Kieran Rollings, Kettering Lodge BC & Steve Bigg, Wellingborough BC. They will be joined by Bob Love, Chris Richards, David Stearn, Mac Cotton and reserve Ray Smith.